Horizon Discovery (LSE: HZD) (“Horizon” or “the Company”), a global leader in gene editing and gene modulation technologies, today announces the launch of its new cell line-derived epidermal growth factor receptor (EGFR) Multiplex cell-free DNA (cfDNA) Reference Standard. The new Reference Standard allows laboratories and assay developers to optimize, validate and routinely monitor performance of polymerase chain reaction (PCR)-based tests, next generation sequencing (NGS), and other novel assays designed to detect EGFR mutations from cfDNA. Horizon’s EGFR Multiplex cfDNA Reference Standard covers ten of the most clinically relevant mutations that predict responsiveness to EGFR tyrosine kinase inhibitors (EGFR-TKIs), including T790M, L858R, C797S and E746-A750del. These variants have been carefully selected to represent a mix of different mutation types, such as SNPs and INDELs, which are challenging for laboratories to detect. EGFR is a transmembrane protein overexpressed in a variety of cancers, especially in non-small-cell lung cancer (NSCLC), which results in uncontrolled cell proliferation, invasion and metastasis. Overexpression of EGFR renders cancer cells sensitive to EGFR-TKIs; however acquired EGFR resistance mutations frequently occur over the course of treatment. Previously, assays were designed to detect those mutations from solid tumor tissues, but with advances in liquid biopsy testing, laboratories are now moving towards establishing assays that can detect those mutations from plasma. One of the major challenges of liquid biopsy assays is detecting mutations from very small quantities of DNA at low allelic frequency. 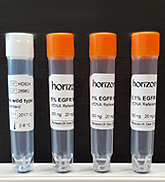 Horizon’s EGFR Multiplex cfDNA Reference Standard is cell line-derived and supplied in a DNA fragment range of 160 base pairs, which is comparable to the DNA size found in real samples. The Reference Standard comes in a set of four vials, with allelic frequencies from 5% down to 0.1%, along with a matched EGFR wild type, enabling determination of assay specificity, sensitivity and limit of detection. There are currently a range of assays on the market that can detect acquired resistance mutations in EGFR, including both PCR-based and NGS approaches. Horizon’s EGFR Multiplex cfDNA Reference Standard has been extensively tested on all major platforms and can be used with a wide range of assays to validate, optimize, and routinely monitor performance.